Your wedding day is ideally one of the most joyous and enjoyable days you will ever experience. Giving your speech as the groom can be a moment to thank those you love and celebrate the person you have married. Even with the best preparation, standing up and seeing a hundred pairs of eyes and the wedding cinematographer starting back at you can make you feel suddenly uneasy. Fortunately, it is possible to deliver a fantastic groom’s speech that is memorable for all the right reasons. Read through this guide that will answer a few popular questions and offer some groom speech tips. 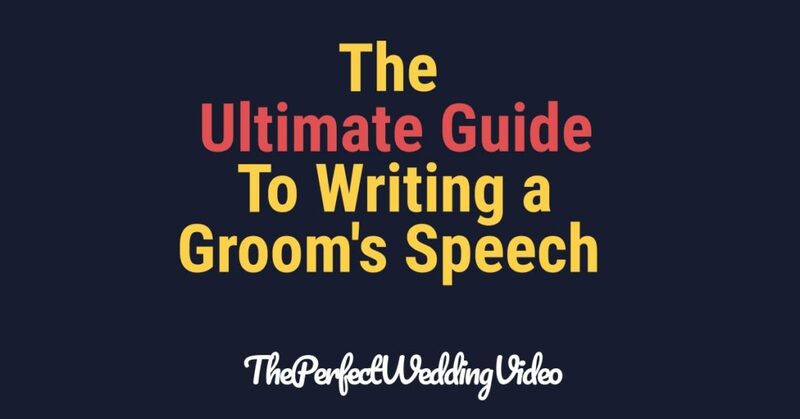 This will allow you to confidently write your groom’s speech and even enjoy delivering it! There are a lot of questions that grooms wish they could have asked before writing the groom’s speech. Here is a sampling of the most popular questions grooms have about the speech itself. How Long Should my Speech Last? Aim for 10 minutes from the time you get introduced to the time you are sitting down after finishing your speech. This will allow about eight minutes of “talk” time, hopefully, interrupted by laughter or some applause here and there. This length will allow your speech to come across as well thought out, yet not drag on. Keep the details light to ensure your guests do not feel left out of your stories. Simply put, the couple your spouse invited from work is not going to understand your “inside” stories about your third groomsman. Join the club! Even the best public speakers have an inkling of stage fright before speaking. Use this guide to prepare and write a fantastic speech. Pro Tip: Curb your urge to drink alcohol to deal with nerves. It will not end well. To better prepare for your big speech, record yourself and watch it back a few times to fix any glaring issues ahead of time. Who Gets Included in the Speech? How Do I Avoid Embarrassing My Spouse with Too Much Detail? Just avoid the details, obviously. Ideally, you will spend at least half of your speech talking about your partner. Rather than opening on the typical remarks about how you love your partner, which everyone would assume, speak of the nuances that attracted you to your partner. Your guests will appreciate hearing the real side of your relationship and a couple of stories about notable moments in your relationship are far more entertaining than a list of attributes you admire in your spouse. Is it Appropriate to Include Humor? Many grooms have concerns that the speech will come across as insincere if humor is utilized. Your guests, however, would prefer to enjoy the speech. Of course, there should be moments of emotion, but it is recommended not to make it an attempt to make everyone cry. If humor comes naturally to you, then it should come across in your speech. Writing a speech can be a challenge, no less one that all your closest friends, family, and your lifelong partner will hear. Oh, and don’t forget that wedding cinematographer recording every word of it! This simple list of tips should help you get on your way to writing the best groom’s speech your friends and family have ever heard. While there is no set “order” to mention people in your speech, you will notice a natural order in this list. Remember, you only have around eight minutes, so you cannot thank everyone individually. This is the time to thank all your guests for attending and supporting you and your spouse on this day. If there is a distinguished guest that could not make it and sent along words of wisdom or encouragement, you can choose to read them aloud at this moment. Spend some time thanking both families for their roles in your lives. It is vital to remember that you should spend equivalent time on your family and the family of your spouse. It is not uncommon for a groom to spend twice as much time on the family of the spouse. However, both families should receive an equal amount of “love” during your speech. At this point in your speech, it is typical to address the best man and your groomsmen. Traditionally, the best man will give a raucous speech that attempts to demean you in some loving way. If you can figure out what his jabs might be, you can get ahead of them in this moment. Pro Tip: If your best man can grow a little inappropriate at times, offer to help him “practice” his speech ahead of time. This could give you the opportunity to edit as needed. If you are trying to keep the speech as traditional as possible, then you should reverse these last two steps. Many groom speech tips suggest ending your speech with “To the Bridesmaids” after thanking them for their services to your spouse. However, I recommend your spouse be the last one to receive your attention. This is the moment of truth. You should be prepared to spend several minutes showing your appreciation for your new spouse. This is not a time to run down a list of obvious things you love about your spouse. Take the time to remember some moments during your relationship that sealed your love and describe those times to your guests. You can do this. You have taken the time to write a speech and practice it. Take a deep breath before standing up and delivering the best groom’s speech anyone has ever heard.